Benjamin Franklin famously said that life’s two certainties are death and taxes. Unless the city learns from its past three decades of mistakes and short-sighted decisions, New Yorkers can count on a third: the certainty of garbage as a perpetual problem in constant need of sound solutions. In New York City, mandatory composting is now upon us. As of July 1, 2015, the Mayor’s office updated Local Law 146 to set requirements and enforcement dates for certain large, commercial food generators to divert their biodegradable food waste from our landfill-bound municipal solid waste stream. With the City Council’s approval of this update, the regulations will now be going into effect. The city will expect these commercial generators to separate their organic waste, put it into special containers, and set it out for privately contracted collection and transport to facilities that will process it into soil conditioners and/or an alternative fuel source for energy production. This marks the first phase of a city-wide composting program that intends for all commercially and residentially generated organic waste (primarily discarded food waste, plus yard waste) to be diverted from landfilling by 2018 – just three short years from now. Right now, organics generation is estimated at about 6,000 tons per day (TPD), roughly half commercial, half residential. The city’s Department of Sanitation (DSNY) would collect the source-separated residential portion, shouldering the expense of hiring additional workers and purchasing expensive specialty collection trucks to do so. Diverting organic waste from long-distance truck and rail transport to far-away landfills matters – in particular, to our environment. Our municipal solid waste, which we ship out of the city to those landfills, generates approximately 679,000 metric tons of greenhouse gases per year – in carbon dioxide emissions alone, the equivalent of adding 133,000 cars to the road. Moreover, the organic materials in the city’s 22,000 TPD of municipal solid waste decomposes in those landfills to emit methane gas, which is at least 21 times more powerful than carbon dioxide in accelerating global warming. And, by the way, it currently costs us $300 million per year to contribute to global warming this way. 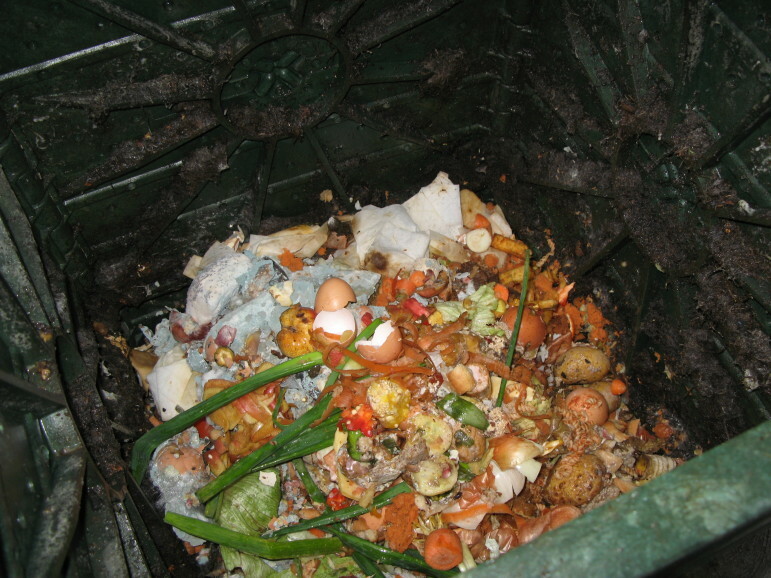 So, mandatory food-waste composting is certainly a well-intended, even laudable, idea. But, is it achievable? Will it pay off in meaningful landfill-diversion rates? Certainly not by 2018. Why? Because, remarkably, the city hasn’t yet put the basics in place for its ambitious 2018 goal: specifically, it has not even determined where and how collected food waste will be processed once it’s been picked it up. In fact, the city has no apparent comprehensive, integrated plan for organic-waste management – no roadmap with all key solutions and requirements in place. Yet, the city is ready to place the burdensome tasks of source-separating organics and making arrangements for its collection and processing onto commercial food-waste generators. Furthermore, it’s ready to launch city-wide organics separation and collection from all households and public buildings without having adequate, appropriate facilities built, or even planned, to process it all by 2018. This, as Yogi Berra would say, is deja vu all over again. New York City’s history of solid waste management has taught us some hard lessons over the past 30-plus years. The first comprehensive solid waste management plan was developed and approved during the Koch administration and updated during the Dinkins administration. It would have solved the problem long-term via in-city resource-recovery programs, technologies, and processing facilities for recyclables and non-recyclables alike, had the city’s political establishment of the time exercised the political will to counter local resistance and had it made sufficient investments in the plan’s key components. Instead, it capitulated to pressures and failed to make adequate investments, essentially kicking the can down the road to subsequent administrations that have inadequately grappled with both recycling and disposal solutions ever since. The closure of the Fresh Kills landfill by the Giuliani administration, again without a thoughtful plan in place, exacerbated the problem. Another critical mistake has been the city’s chronic unwillingness to tackle the hardest waste-management challenges first, whether that’s developing a sound, end-to-end, integrated plan or investing the time and resources necessary to ensure all plan components are in place and working together. Instead, as has happened before with certain recyclables and is now evidenced by the city’s envisioned 2018 composting mandate, relatively easier components such as separation and collection are being addressed first, while the tougher, longer-term components – placing composting within the context of an overarching solid-waste-management plan and ensuring adequate organics-processing capacity is in place as part of that plan – go unaddressed. The City Council would be wise to learn from these lessons and pause the city’s well-meaning but currently unrealistic commercial-collection mandate – and certainly its broader, 2018 composting program ambitions for residential organics. It should, instead, take time to work with the Administration to develop a truly comprehensive, realistic, long-range plan that ensures adequate organics-processing capacity is in place before implementing any composting mandate. To do otherwise would be to invite failure. And that would be unfair to New Yorkers. Separating food scraps is much more burdensome than separating recyclables. These biodegradable materials, unlike recyclables, quickly decompose, causing potential odor and pest problems. In kitchens and building/home staging areas, it requires extra storage space. And, it requires additional time and labor from service workers in every multi-dwelling building. Without a plan to ensure adequate, appropriate processing facilities and/or other non-landfill disposition technologies, recovered organic waste could very well still end up in landfills (just as recovered recyclable paper did during the first 12 years of the city’s recycling program, due to inadequate processing infrastructure and recycled paper market volatility). What a demoralizing waste of time, money, and effort a mandatory composting program that results in only minimal, if any, landfill diversion would be. But, that doesn’t have to happen. There are at least three potential solutions within the city’s reach which, in some combination, could form the basis of a workable, long-term plan for residential organic-waste management. What’s more, these could be pursued under the city’s offices’ direct influence and control. True, they each carry various challenges, including inter-agency cooperation. But, responding to challenges with practicality and forethought is what’s required for dealing with the complexities of managing New York City’s solid waste stream. These three potential solutions are: building organic-waste processing facilities, either locally or at existing, marine-transfer- and rail-transport-served landfill sites; retrofitting or updating some of the city’s existing waste-water (sewage) treatment plants to co-process food waste; and encouraging the installation of household, in-sink garbage grinders/disposers. As regards building new organics-processing capacity, waste-processing facilities are most often owned, built, operated and financed by private firms with the requisite expertise and proprietary systems, provided the city is willing to enter into long-term contract commitments guaranteeing the amount of waste to be delivered. Turning to public/private partnerships relieves the pressure on the city’s constrained capital budget, freeing up funds for other critical municipal needs. The city has, in fact, recently issued a bid solicitation for an organics-processing facility exclusively for DSNY use. However, this solicitation suggests that a facility is to be built outside city limits. This decision is puzzling, as it will continue the city’s current practice of incurring substantial transportation and environmental expense to dispose of organics in a far-away location. It’s also ironic that this decision has been made by an administration that extols environmental justice, yet is apparently willing to continue the unfortunate status-quo (in place since the failure to site in-city waste-to-energy facilities during the 1980s) of exporting New York City’s waste to distant, often out-of-state locations, while generating tremendous amounts of greenhouse gasses and incurring substantial cost in the process. Building organic-waste processing facilities within city limits instead of in other jurisdictions is important, if not easy. It’s important because it enables New York City to do the right thing – to solve and manage our own waste challenges instead of exporting them to out-of-city locations. Equally important, it allows the city to retain full participation in the procurement, contracting, siting, permitting, and operations-monitoring processes, rather than give over control of these to other municipalities or states. In addition, potentially marketable byproducts remain available for local use. And it’s not easy, for several reasons. The push in recent years toward urbanization, gentrification, and manufacturing-zone creation has left the city with very few suitable sites for infrastructure such as waste-processing facilities. The city has neither identified nor set aside for DSNY use whatever suitable sites, if any, remain – nor has funding for this been included in the city’s most recent capital plan. It’s also not easy because there will always be NIMBY (“Not In My Back Yard”) community-pushback issues to solve – a fact of life when siting any waste-management facility. And, let’s not forget, it takes at least five years from site selection to open the doors to even new facilities that are welcomed community enhancements, such as schools or fire stations. This reality should not be lost on planning that involves building new in-city facilities. One proven organics-processing technology – successfully and extensively employed in Europe for over 30 years – relies on anaerobic digestion (AD) of organic waste. This is a controlled decomposition system replicating the natural digestive process by which organics are broken down in the absence of oxygen with biologically active organisms. The methane gas released is subsequently captured and converted into electricity or processed into natural gas by existing public utilities. The residue is used as a soil conditioner by available markets. The most successful large-scale AD facilities handle 500-600 TPD and require six to 10 acres. So, five new facilities would be required were the city to electonly to use ADs to process the 3,000-TPD residential organics waste stream. But, assume there are no suitable in-city sites for AD facilities and/or that in-city NIMBY issues cannot be overcome, forcing the city to rely on new out-of-city processing facilities. We would still need in-city transfer stations to stage collected, source-separated organic waste for transport to such locations. Current DSNY-owned marine transfer stations are tied to rail-served disposal sites. Therefore, the city would only be able to ship collected organic waste to new AD facilities located along these rail lines. Further, were the city to resort to contracting private transfer stations for collected organics, how would this square with the city’s current efforts to respond to community concerns and advocate for environmental justice by reducing the number and/or limiting the capacities of its existing transfer stations? Clearly, regardless of the processing policy choices the city ultimately makes, some in-city sites will be needed. So, the city should move immediately to identify and reserve any remaining available sites for use by DSNY as potential properties – before other prospective users gobble them up. The city has recently awarded a long-term contract that includes potential construction of a pilot organics-processing facility on-site at an existing upstate New York landfill, where a minimum of 3,300 TPD of DSNY-collected residential solid waste is expected to be rail-transported then trucked directly into the site for disposal. Once this initial 200-TPD pilot facility becomes operational, residential waste, including unseparated organics, would be processed at the landfill to recover organics for diversion. In other words, no organics separation by residents would be necessary. The organics would, instead, be extracted on-site by equipment that can then turn it into slurry for beneficial use by a nearby waste-water treatment plant. This pilot facility, after five years of successful, proven operation, can then be expanded to 600 TPD, according to the contract. Like any other waste-management facility siting, this solution is encountering significant local push-back, and political/bureaucratic process issues have already arisen which will need to be overcome by local authorities in the affected upstate community. Solutions such as this one present a very interesting model for the DSNY to expand to other currently contracted landfill facilities that have sufficient expansion acreage to develop their own adjacent AD (or other composting technology) facilities and employ similar on-site organics-extraction processes. The beauty of this solution is that the residential waste bound for each such landfill site is already collected and transferred via existing DSNY marine-transfer and rail-transport facilities. The upshot? No burdensome residential organics-separation required; no additional transfer/transport infrastructure necessary, as existing city facilities are utilized; and no need to site and build significant in-city processing infrastructure, especially with appropriate sites so few and far between. Once again, though, utilizing this landfill-AD facility co-siting model as a potential piece of a comprehensive organics-processing solution requires long implementation time frames, as would building in-city capacity. Even the upstate pilot organics-processing facility discussed above will require permitting, construction, and five years of successful operation before expansion from 200-TPD to 600-TPD capacity can occur. And, even this expanded capacity would represent only about one-fifth of that required for the city’s total volume of residential organic waste. Retrofitting, or updating, existing city waste-water treatment plants (WWTPs) for potential co-processing of food waste not only can reduce land demands for new AD facilities, but also has the key advantage of utilizing already city-owned and -operated facilities – thus mitigating the battles and special restrictions applicable to new facility sites. New York City’s WWTPs have been digesting sewage waste for nearly 20 years and shipping out the final residue to landfills, at high cost to the city. To counter this, the New York Department of Environmental Protection (DEP) upgraded Brooklyn’s Newtown Creek WWTP to eventually process an additional 500 TPD of organic materials, up from its current 50 TPD – also at considerable, though one-time, expense. This WWTP produces energy from the decomposition process’s resultant methane, which is recovered and used internally, with excess sold to National Grid – a local utility. But even this additional capacity falls far short of the 3,000 TPD organics-processing capacity needed and will take years to realize. Meanwhile, the Hunts Point WWTP has been suggested as a viable candidate for similar upgrading. Despite this solution’s advantages, the city has neither announced any explicit plans for such potential upgrades to Hunt’s Point or any other city WTTP nor set aside funding in its ten-year capital plan. Residential in-sink garbage grinders make great sense for properly disposing of food waste, given that food by definition is 70-percent water. In-sink garbage grinders would seem to solve the distinctly burdensome problems organic waste separation and storage present: it’s easy, eliminates odor and pest concerns, and eliminates the need for additional indoor storage space and building-employee labor demands. Of course, to encourage installation, the city would have to create financial incentives, such as tax credits or grants, to underwrite owners’ costs for purchase, installation, and plumbing updates. As sensible as this solution is, it has raised certain concerns by some who may be unfamiliar with their widespread use. One is the fear of overwhelming the municipal wastewater system during major rainstorms. This, however, is a manageable issue. New York City’s wastewater-treatment system’s 14 sites collectively handle 1.2 billion gallons per day on non-rainy days. If all 3.2 million existing households had an in-sink grinder installed, each generating an additional one to two gallons of wastewater flow daily, only 3.2 million to 6.4 gallons of wastewater per day would be added to the system – a proverbial drop in the bucket relative to the city’s 1.2-billion-gallon daily capacity. This would neither cause nor exacerbate combined sewer overflow events. Consider this concern from another perspective – that of increased demands for new housing development relative to per-household water use of a minimum 150 gallons daily. The roughly 20,000 to 40,000 newly constructed housing units built in the city over a mere two-year period generate the same amount of wastewater as in-sink grinders would, if installed in all existing residences today. If concerns about combined sewage overflow are legitimate, then why wouldn’t the city advocate for a major curtailment, if not moratorium, on ever-increasing new housing (and commercial) development, based on such increased wastewater-generation concerns? No such advocacy is apparent. Another concern raised is that introducing food waste into wastewater might increase its nitrogen (a pollutant of concern, unless properly managed as a nutrient) content, thereby ultimately increasing waterway contamination. This concern, too, is manageable. The principal source of nitrogen in wastewater is, in fact, from urine. Food waste, on the other hand, is mostly carbon, which actually has beneficial uses in wastewater treatment. In fact, DEP buys supplemental carbon, in the form of methanol, for its secondary treatment tanks to counteract nitrogen blooming. That said, the city should first determine whether or not any of its wastewater treatment plants would be unable to easily accommodate incremental nitrogen increases from substantial in-sink disposer expansion, due to permit-compliance limitations; and if necessary what modifications or technologically advanced solutions can be deployed to operate more effectively to meet these regulatory mandates. One more concern – potential damage from food waste to the city’s sewer pipes – is, likewise, baseless. Over 60 million in-sink grinders are installed in the U.S.; in some cities more than 80 percent of homes have at least one, without such adverse impacts. In fact, slurry from in-sink grinders passes more easily through sewers than does human waste, given its particle size and specific gravity. In residences, clogs would be even less likely, as in-sink grinders would first pulverize food scraps put into sewer pipes. Successfully meeting the many challenges of managing New York City’s solid waste has never been easy. Developing practical, end-to-end solutions for processing collected organics will be no different. But it is doable. However, it requires not just the political will, but also the willingness to tackle first the toughest, longer-lead-time solution components – rather than begin with the easiest-to-implement components. Although addressing the easiest, quickest components first is tempting – and often typical – this too frequently results in a false sense of accomplishment that can lead to loss of momentum and drive for then implementing the harder, yet most critical, pieces of a comprehensive solution. In the case of the city’s organics initiative, this practical approach includes starting with the most challenging of whichever processing options are selected. The administration and the City Council must honor New Yorkers’ participation – and faith – in a mandatory composting program by ensuring that such a program’s goals can actually be achieved. Good intentions aside, common sense demands that the city lay out its intended program’s components – its context, intentions, expectations, decision-making responsibilities, requirements, and solutions – in a comprehensive, well-considered plan built around realistic time frames before it imposes any mandatory actions. To do otherwise would be…a waste. Norman Steisel, a graduate chemical engineer, served as New York City First Deputy Budget Director and Commissioner of Sanitation under Mayor Koch and as First Deputy Mayor during the Dinkins administration. Currently Mr. Steisel is president of Enessco Strategies, a firm he founded, providing strategic and financial advisory services to environmental firms and governmental authorities. We live in an attached house. Many years ago we put in a garbage disposal (grinder), but after it clogged up our pipes, we had it removed. There was a 90 degree angle that could not be changed. Without a gut renovation in a 100 year old house, a disposal is not workable. Also, some things cannot go into a disposal–pits, corn cobs and leaves, and what about all the water that is needed to flush the waste through the pipes? It’s not practical here. Already there are problems with collection. The DSNY workers pass by the brown containers and clearly marked alternative containers with yard waste. The small containers for the kitchen take up too much of our miniscule counter space. The recycling bags are expensive and easily break. After cleaning up too many broken bag messes, we gave up. Few people recycle food waste on our block. A study commissioned by the Sanitation Department and released this week found that a zoned system, in which companies would bid for all the commercial pick-ups in a particular area, would significantly reduce traffic and pollution. A highly anticipated city study of commercial waste collection has been delayed, putting off any decision about a new franchise zoning system and ensuring that the fight over the industry’s future is far from over. Many New Yorkers don’t know what happens to that coffee cup after they throw it away, but the ugly truth is slowly being revealed.